As a matter of habit I review design sites looking for inspiration and ideas that I can practice and incorporate into my elearning designs. Often I won’t even use the design ideas for real work, but I still like to practice building them. This practice lets me develop better designs skills and helps me become more efficient using my elearning tools as I develop more production tips and procedures. In fact, over the years that’s how I learned most of my advanced PowerPoint skills. When I find something I like, it gets added to a folder. Then when I get time or need some inspiration, I’ll run through the folder for ideas. Here’s something I ran into a couple of weeks ago that will come in handy for an elearning course. I’ve also included downloads for Storyline and PowerPoint below. 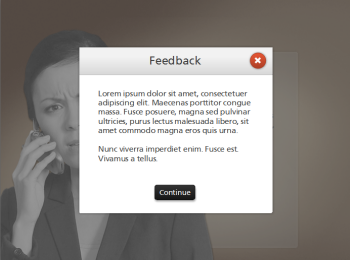 A common part of many elearning courses is the instruction or feedback screen. I like to call them “gate screens” because they serve as gates by stopping the flow of information until you’re ready to move on. I wrote more about them in this recent blog post on stopping the learners before they get started. Because these gate screens are very common to elearning, a simple way to speed up production of your courses is to pre-build a few of them. And then when you need a gate screen, you’re ready to go. One of my favorite design sites is Dribbble. It’s a community of designers who share ideas and feedback. 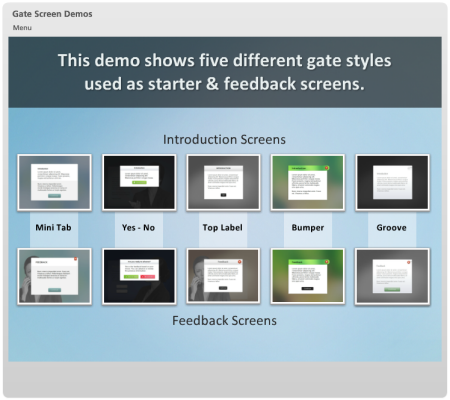 As I was looking at some of their demos a few reminded me a bit of the gate screens I’d build for an elearning course. So I used some of those ideas as inspiration for a few simple gate screens. Below is a demo of five gate screens. 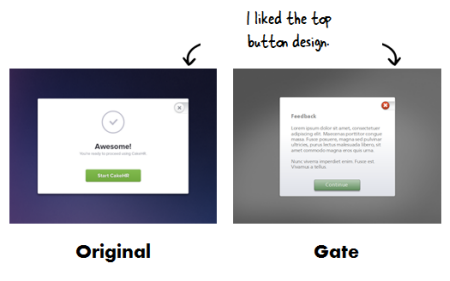 I show them as both introduction and feedback screens. The demo’s built in Storyline. But you can use them in Articulate Presenter and PowerPoint, as well. In fact, I used PowerPoint to build the all of the initial templates. Which allows me to reiterate something I stress all the time—PowerPoint is a great tool for basic illustrations and graphic design. I’ve included some files for you to download and use if you’d like. Feel free to use them as you wish. Storyline: You’ll find two slides for each gate screen. PowerPoint: You’ll need to copy and paste the gate objects to a slide. Then set your hyperlinks to branch to the appropriate slides. Here are links to the originals because I want to give props to the many designers who freely share their ideas and things they’re working on. They always give me some cool ideas to play with. The first is to continually look for inspiration and apply the ideas. 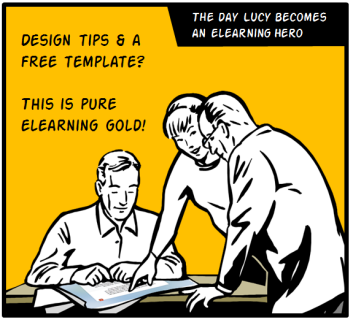 They’ll improve your design skills and help you be more fluent with your elearning tools. The other key idea is that you can pre-build certain parts of your elearning course. Then when you need them you’ll be able to speed up production and save time. Have you found any cool ideas that would make great gate screens? If so, please share them with the rest of us. Who Should Decide How You Decide? I like the designs. Are those the same backgrounds from the community downloads? Will you do any tutorials on how to use the templates? Our team appreciates all of the free templates and downloads. We’ll use these. I like how you turn someone else’s ideas into something practical. As always, thanks for the freebies…my job would be difficult without all the things you help me learn. Your blog and emails are awesome! The tips and information you share has been a tremendous help to me. Thank you for these freebies! Great!! Very useful! Thanks Tom!! Great – thanks to all involved in sharing these. Excellent I am glad you have done these. Helps me alot. @Joseph: there’s a setting in the Storyline player where you can move the menu to the top bar. Thank you so much for this inspiring and useful content! I learn so much from this blog! Swift Elearning Services Pvt. Ltd.
@Tom, thanks. Great blog and and great tips. Thanks Again. Thanks for share this tips and inspirational images. 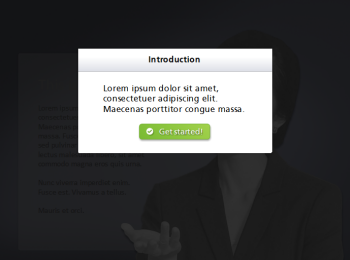 I trying to do something new on the elearning design.